Where is the end of the habitable world? A few places in the Northern Hemisphere might vie for the title but in the south there’s one clear winner: the tip of South America. And down there the Argentinean city of Ushuaia claims to be the “Fin del Mundo”, the End of the World. That may suggest a one-horse town with a few ramshackled huts and a general store and, if so, visitors to Ushuaia will be surprised to discover a clean and modern city of some 60,000 residents that is just strange enough to hold the visitor for a few days – or a few weeks. In world travel terms, Ushuaia is famed as the departure port for voyages to Antarctica and this sees it through the busy months of the brief summer between mid November and mid March. In winter, the hotels and hostels fill with skiers and snowboarders. But many visitors are now coming simply to reach the end of the road. It’s beautifully located to simply sit and ponder “where next?” The mountains of the Andes rise directly behind the glacier overshadowing the city and the Beagle Channel provides the waterfront. Flying into Ushuaia is not for the faint-hearted. Often it seems that the pilot is seeking a hole through the clouds that isn’t filled with a snow-capped mountain and many take the easy option and let down through solid cloud over the Beagle Channel. The small Chilean military and fishing village of Puerto Williams on the southern shore may be glimpsed before Ushuaia and its ship-packed dock hoves into view and seconds later you’re on the ground at Argentina’s first privately-owned airport. Formalities consist of little more than fighting for a baggage trolley. Despite its casino, coffee shops and glittering tourist shops, the town still has a frontier air about it. Indeed, some of the outer areas look to have changed little since the first settlers put their cabins on logs so they could be rolled to a new site when the ground became too boggy. Apparently some drinking sessions resulted in people returning home to find their houses had been moved elsewhere. 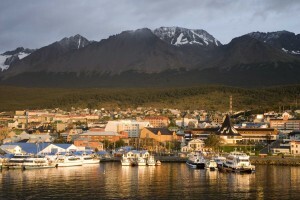 Ushuaia was named by early British settlers from the title the local Yamana people gave the place. And Britain decided that Ushuaia (being on an island, like Australia) was a good place for a prison. The prison closed in 1947 but the building still stands and is now a grim museum of local history. Surprisingly, it’s not the waterfront that is the centre of city activity but rather San Martin, the street one back from the water and up the hill – the first of many steps in this terraced town. This is where the great majority of shops and restaurants lie – at one end is the prison and the other is the closest Ushuaia has to a mall. If you know that a friend is also in Ushuaia, a promenade along San Martin is likely to find them. Anyone who has visited Ushuaia in the past will be impressed by the changes they’ll see when they return. Nowhere is that more evident than down at the cruise ship dock. Six years ago, you could walk onto the dock with a wave to the security guard and your companion was likely to be one of the friendly but remarkably short-legged dogs in which the city abounded. Now there’s two security posts that funnel you along a strip of tourist stalls and a whole bypass system to get truck and bus traffic down onto the dock. In the peak summer period, the whole place can resemble an Alaskan port town with cruise ships disgorging thousands of tourists onto the streets of Ushuaia. Evidence of the strength of the tourist peso was provided when the Argentine economy collapsed five years ago as the parity between the US Dollar and the Argentinean Peso was finally strained beyond breaking port. While the rest of Argentina suffered, Ushuaia was hardly affected and its building boom continued. The town logo, written along the waterfront is now “Ushuaia – end of the world beginning of everything”. The few who elect to come overland to Ushuaia will find it’s the most civilised city for thousands of kilometres. Buenos Aires lies on roughly the same latitude as Sydney and Ushuaia stands more than three thousand miles to the south –below the level of Australia’s sub-Antarctic Macquarie Island. Even in summer snow is as likely as a day with the temperature in the 20s. Getting here by road is an ordeal as you must travel over the endless, grey, windswept, featureless plains of Patagonia. Eventually you run out of the South American continent and have to catch a ferry across the Straits of Magellan to the Island of Tierra del Fuego. And the road passes into the northern, Chilean side of the island before cutting back to the Argentinean side on the east coast. For most visitors, after the attraction of the shops pales, the first excursion is to the 630 km National Park that really is the end of the road. Here you may see condors flying over waterfalls and mountains and you’ll certainly see the great damage caused by the beavers that were introduced from Canada to start a fur industry. Train buffs will want to take the 100 minute train trip along the 8 km of rail towards the park aboard the Ferrocarril Austral Fueguino that was built by the prisoners. 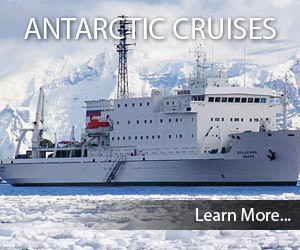 There are also numerous boat excursions out to see the seals and Magellanic penguins that live along the Beagle Channel – you’ll probably see black-browed albatross along the way, too. The boats will also pass Les Eclaireurs lighthouse on one of the promontories in front of the city. This is not the one that featured in the Jules Verne story of the Lighthouse at the End of the World – that is on Isla de los Estados, far to the east and on the way to the Falkland Islands/Malvinas. One thing that every visitor to Ushuaia should do is take the chance to eat centolla, the local delicacy. This is very fresh king crab from the Beagle Channel; it has a delicate flavour and is quite like Alaskan king crab at the other end of the world. There are several restaurants that specialise in it – Freddy’s on San Martin is one. But it’s worth splurging at Kaupe, the city’s best restaurant high on the hill overlooking the Beagle Channel that provides many of the menu’s ingredients. Another good place to try is Ku’ar, a rustic bar on the eastern edge of town that has comfortable rug-strewn bleacher benches looking out a huge plate glass window to the rocks and water at its door. If you have the time and the inclination to face the bureaucratic challenge, the best trip you can take from Ushuaia is to Cape Horn. The most useful place to start this is at the yacht club over by the old airport. There will be yachts sailing regularly to Puerto Williams on the Chilean side of the Beagle but the authorities frown on them charging for the voyage. In good conditions it will take somewhere between a few hours and a full day to cover the 50 km or so. At Puerto Williams you’ll complete immigration formalities at the Micalve, an old Rhine patrol boat that was sunk at the dock to become one of the most unusual and legendary yachting bars in the world. It belongs to the Chilean navy but it’s a semi-permanent home to some 20 yachts from around the world. From here it’s about a five day return sailing voyage to Cape Horn. Cape Horn itself is one of the most feared shipping icons on earth. There are literally scores of wrecks around its shores and when the wind is blowing (as it usually is) and the sea swell is running at five metres or more it’s easy to see why. Here the low pressure systems that tirelessly circle Antarctica producing the prevailing westerlies are squeezed between the bottom of Patagonia and the top of the Antarctic Peninsula and that increases their intensity. However, on a sunny day when the wind has dropped it’s easy to land a dinghy at Cape Horn’s tiny sheltered beach and walk up to the top of the hill to look at the Albatross-shaped memorial to lost sailors and visit the tiny Chilean navay base (pop. 2) that doubles as a post office and gift shop. On the way to Cape Horn you’ll come to realise that Ushuaia may be the world’s southernmost city but Puerto Williams is the southernmost town and the tiny village of Puerto Toro around the corner can lay claim to be the southernmost community in the world. When I first visited Ushuaia in 1996 it was merely a nice enough gateway to Antarctica. In the subsequent decade the city has grown in sophistication and facilities so it’s now very much a destination in its own right. 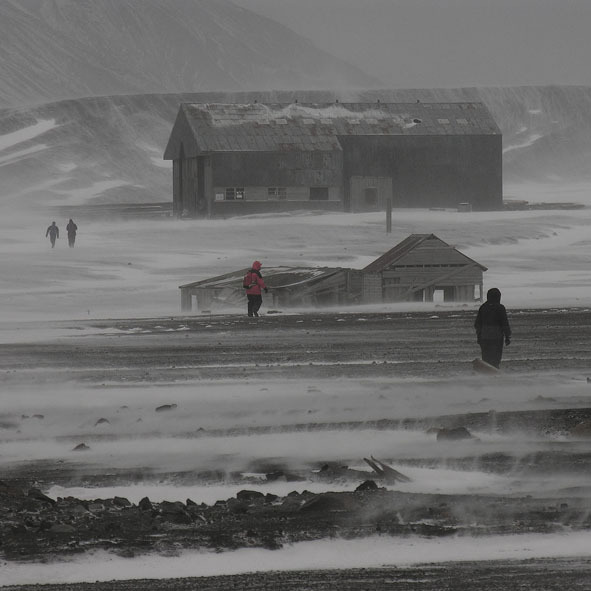 If you wish to travel to the end of the world you won’t be disappointed. Unless you have unlimited time you’ll fly to Ushuaia and that will almost certainly be with Aerolineas Argentinas that operates several times a week out of Sydney to Buenos Aires (via Auckland). It’s much cheaper to buy your ticket from Australia to Ushuaia than it is to buy the international and domestic legs separately – and you get the two piece international baggage allowance all the way to Ushuaia. There are several websites with a lot of useful information on Ushuaia. A local private tour operator who can organise whatever you wish to do in and around Ushuaia is Alicia Petiet, petietalicia@yahoo.com. Other useful tour operators are: Rumbo Sur, www.rumbosur.com.ar, or Tolkeyen, www.tolkeyenpatagonia.com. Australians are issued with a three month tourist visa upon arrival in Buenos Aires. This is free. However, if you come to Argentina through Chile you will have to pay for a visa in Santiago and the cost is around $70.